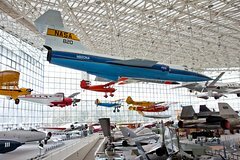 Get ready to travel through air and space at the Museum of Flight with this admission ticket. Explore over 160 air and spacecrafts from the Boeing 787 Dreamliner to the Supersonic Concord at the largest independent, non-profit air and space museum in the world! There are 175 aircraft and spacecraft and tens of thousands of artifacts and rare photographs. Tour Air Force One, 747, Concorde and more in the Aviation Pavilion and then head beyond to the Space Gallery to see a Space Shuttle Trainer. Plan ahead and skip the crowds with this general admission ticket. Once you step inside, see an air and space themed 3D Movie in the museum's 3D movie theater. Walk a short way over to the T. A. Wilson Great Gallery and see over 39 full-size historic aircrafts. View it at night to see the dramatic lighting as the planes hang above you. Learn about the history of flight from the beginning when before passenger air travel airmail revolutionized the way we communicate. Learn about World War I and II Fighter Planes and the men and women who designed, built and flew them. Step aboard a US Air Boeing 737 and see the cockpit up close and check out some special on-board videos. Walk across the T. Evans Wyckoff Memorial Bridge where on a clear day you will get excellent vistas of Mount Rainier to the southeast and the Seattle-Tacoma International Airport to the south. Stop by the gift shop on your way out for a souvenir to take home.